Sweden currently has 41 active airports (in terms of number of passengers) among which half of them are also international airports. 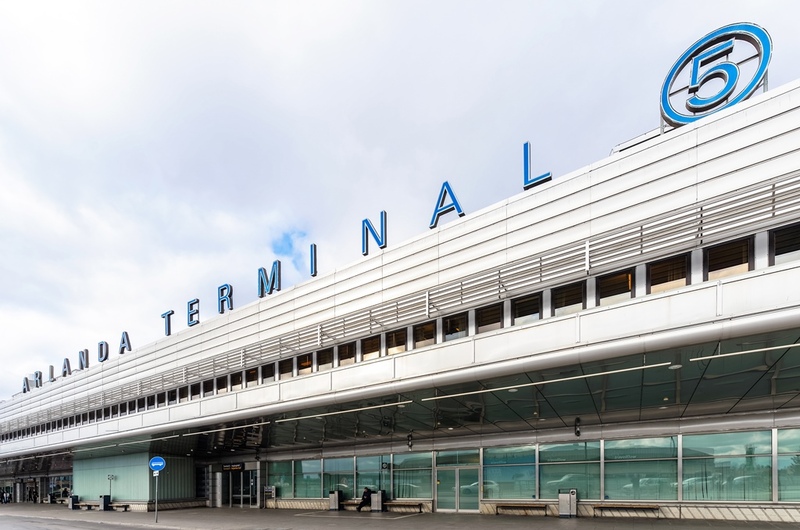 The busiest airport in Sweden is by far Stockholm-Arlanda Airport which has great connection with the rest of Swedish airports and it has regular domestic and international flights. Stockholm Arlanda is the most suitable airport if you are traveling to Stockholm region. If you are traveling to southern parts of Sweden, better choice would be Gothenburg or Malmö Airport (or even Copenhagen since it is a larger airport and it has a great connection with Sweden). Stockholm-Arlanda Airport is the largest international airport in Sweden, located near Märsta, approximately 37 kilometres north of Stockholm city centre. The airport has four terminals, T2 and T5 for international flights and T3 and T4 for domestic and regional flights. Stockholm Arlanda serves as a main hub for Scandinavian Airlines, NextJet and Norwegian Air Shuttle. This airport is also the best option if you’re visiting Uppsala (36 km from the airport). The centre of Stockholm can be easily reached by Arlanda Express train which runs every 15 minutes. The second largest airport in Sweden serves the city of Gothenburg and it is located in the municipality of Härryda, 20 kilometres southeast of Gothenburg city centre. The airport has two terminals, one for domestic flights and the other for international flights. The most popular seasonal flights to and from Gothenburg are operated from Greece and Spain. It takes around 30 minutes to reach Gothenburg from the airport by Flygbussarna buses. Another important Stockholm airport, but with a lot less passengers is Stockholm-Skavsta Airport. Also known as Nyköping Airport, Stockholm-Skavsta Airport is located 100 kilometres southwest of Stockholm and it serves as a hub for low-cost airline companies, more precisely Ryanair and Wizz Air. The number of passengers continues to increase every year along with new scheduled flights (to UK, Bulgaria, Poland and Austria). Buses from Skavsta Airport are operated by Flygbussarna buses and it takes approximately 90 minutes to get to Stockholm. Stockholm-Bromma Airport is the closest of all the airports serving the city of Stockholm since it is located 7.4 kilometres northwest of Stockholm. The airport is not that busy and it mostly operates domestic flights, but there are also some international flights, such as those to Brussels, Helsinki and Aarhus. You can reach the center of Stockholm from the airport in 30 minutes by taking buses 110 or 152. Formerly known as Sturup Airport, Malmö Airport is the fourth busiest airport in Sweden. Though it serves the city Malmö and the rest of the county, the people travelling to Malmö prefer using Copenhagen Airport because it is closer to Malmö and more convenient. However, Malmö Airport keeps growing in terms of passengers numbers and it keeps introducing new flights (there are even regular direct flights to Tehran and Baghdad). It takes around 50 minutes to get to the centre of Malmö from Malmö Airport. Luleå Airport is situated in Kallax, about 7 kilometres southeast of Luleå city centre. Though it is the sixth largest airport in Sweden in terms of number of passengers, Luleå Airport mostly focuses on domestic flights. Still, there are many seasonal charter flight such as those to Greece, Croatia and Spain. You can easily get to Luleå city centre by bus lines 4 and 104 which are operated by LLT bus company. Umeå Airport is located about 5.4 kilometres from Umeå city centre and it mostly operates flights to Stockholm-Arlanda Airport and Gothenburg Airport, but there are also few international flights as well (Spain, Greece and Finland). Buses run every 20 minutes from the airport to Umeå city centre (during high season) and the journey lasts 8 minutes.